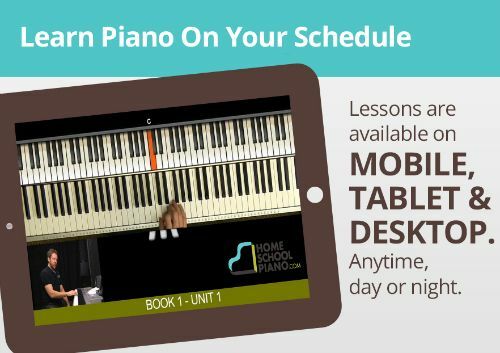 CorePiano ~ Beginning students will learn the basics of the piano by learning the notes, finger numbers, half & whole notes, time signatures, ties repeats, basic rhythms, and more. There are 33 lessons and a 46 page Core Piano PDF. 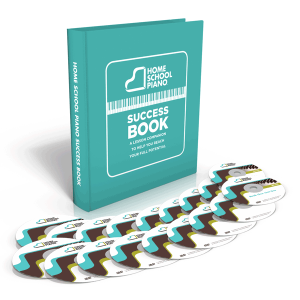 Book 1, Perfect for Beginners~ This beginning level features 6 fun original pieces, and you will learn how to read music, improvise, and create your own music. 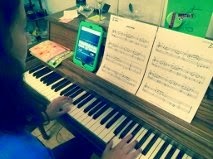 There are 6 Units with 7 ten minute lessons covering technique, rhythm, ear training, reading music, song, improvisation, and a bonus. 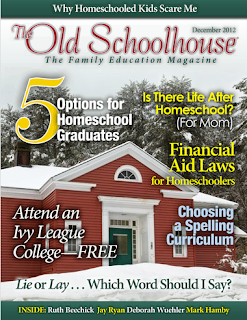 The PDF contains 52 pages to go with the lessons. Book 2, Building a Foundation ~ There are 6 Units with 7 ten minute lessons in this level also, and the PDF is 30 pages long. These lessons also cover technique, rhythm, ear training, reading music, song, improvisation, and a bonus. Book 3, Unlocking the Pianist Within ~ Technique, rhythm, ear training, reading music, song, improvisation, and a bonus are covered in the 10 minute lessons. There are 7 lessons for each of the 6 Units. The lessons along with the 33 page PDF teach 5 finger scales, chord arpeggios, broken triads, syncopation, voice leading and more advanced scales for improvisation. 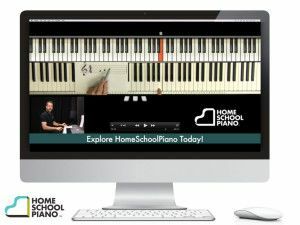 The HomeSchoolPiano subscription can be used for up to 5 students, you will have unlimited life-time access along with all downloads, jam track, sheet music for $299. You also have the option of making 3 monthly payments of $99.97 per month. 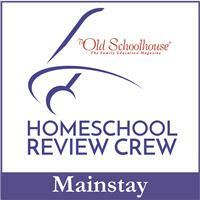 I have been using HomeSchoolPiano with all three of my girls ages 9, 12, & 13. They have all taken piano lessons for years and are at three different skill levels. I downloaded all the PDF files onto my computer to make it easier to print out what we needed. The girls used their iPad mini for each lesson, so they could take it to the piano with them. Each student has their own login and after logging in there is a box on the right side that will take you to where you left off. Each girl watched their short lesson and then they would practice what they had learned. The time between lessons varied according to how fast they caught on to what was being taught. All three of my girls love sheet music, so they went through the PDF files to look at all the songs that are taught and picked out some that they wanted to play right away. Amber is 13 and plays piano really well. She loves to play and she has been giving beginner lessons for a couple of months. I had her look at HomeSchoolPiano and see where she thought was a good place for her to start. Her response was the same as mine, she needed more lessons on ear training and improvisation. She has worked on both in the past, but she just hasn't focused on them a lot. 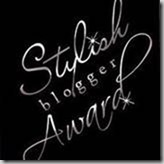 She watched a couple of the videos on ear training and improvisation from the beginning of Book 2, but then she thought she should move ahead in Book 2. Amber is the type of person that when she sets her mind on something, she will do it. She has had several piano teachers in the past and we even quit going to one because she wouldn't let Amber choose music that would challange herself, and another because she thought the teacher wasn't really helping her to improve. Amber is liking the lessons from HomeSchoolPiano very much. She loves having access to all the lessons, so she can skip around and only work on what she needs to instead of sitting through parts of lessons she already knows. She likes the pace of these lessons & thinks the instructor does a great job. This was during Amber's lesson, without practicing. Delaney is 12 and she is not as advanced on piano as Amber is. She started in Book 2 and she has been going through the entire lesson each time. 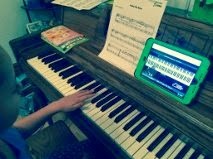 She said she doesn't mind having a piano lesson on the iPad, but she prefers having an actual teacher. She is my child that doesn't like to be on the computer, she would rather do something else than even play games on one. Alaina is 9 and her piano level is behind Delaney. She doesn't mind playing the piano, but it isn't something she loves to do. I had her start in Unit 4 of Book 1. Alaina was a little frustrated at first, because she thinks the lesson is too fast. She would like to have more time to implement what was taught during the video. She did start pausing the video several times during the lesson, so she could do exactly what the instructor had done. I think HomeSchoolPiano is awesome. I just keep thinking I wish I would have had this program years ago when my two older children started piano lessons. I don't even want to add up how much money we have spent over the years on lessons. My adult son is currently looking for a nice keyboard because he misses playing piano, but my adult daughter has no desire to play at all. 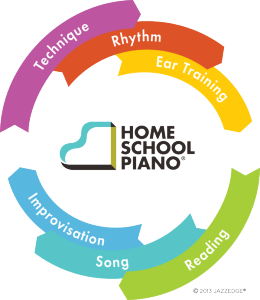 Even though I don't think music lessons are ever a waste of money, but I could have saved a lot over the years with HomeSchoolPiano. I can read music, but I do not know how to play piano. 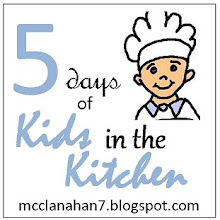 I have also sat through many piano lessons with my kids and I feel this program is far superior to some of the teachers we have had through the years. I love that the ear training and improvisation is included even in the lower lessons. And now when Alaina tells me she can't remember what the piano teacher said, I can make her more responsible and have her rewatch the lesson instead of relying on me to remember.